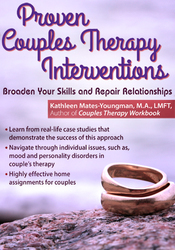 Kathleen Mates-Youngman, M.A., LMFT, is an author and speaker. She has a private practice in Southern California specializing in couples therapy as well as treating individuals with anxiety, depression, grief, chronic illness and life transition issues. She is the author of Couples Therapy Workbook: 30 Guided Conversations to Re-Connect Relationships (PESI, 2014) and the card deck, Love & Connection Cards (PESI, 2015). She is completing a second book for couples therapists based on this seminar and is also a regular contributor to a local lifestyle magazine in Orange County, California. Along with her work as a national speaker for PESI, Kathleen does workshops for couples and individuals, as well as graduate students.